Hello PlayStation.Blog friends, welcome to another season of MLB The Show! For anyone who grew up collecting baseball cards (I did!) or dreamed of managing a Major League Baseball team (I wish! ), you may want to spend a little more time in Diamond Dynasty this year. And even if you didn’t collect baseball cards as a kid, Diamond Dynasty still provides a variety of great experiences for gamers, especially those who love strategy. In addition to talking about the awesome new things we have for Diamond Dynasty this year, we’ve also put together a Diamond Dynasty guide below to help jumpstart newcomers to the game mode. Would a fly-ball ever drop in the gap with an outfield consisting of Billy Hamilton, Kenny Lofton, and Kevin Kiermaier? What if Ichiro’s rookie year was in 1997, and Ken Griffey Jr and Ichiro were united? What if Mike Schmidt came three decades later and formed an infield with Jimmy Rollins, Chase Utley, and Ryan Howard? 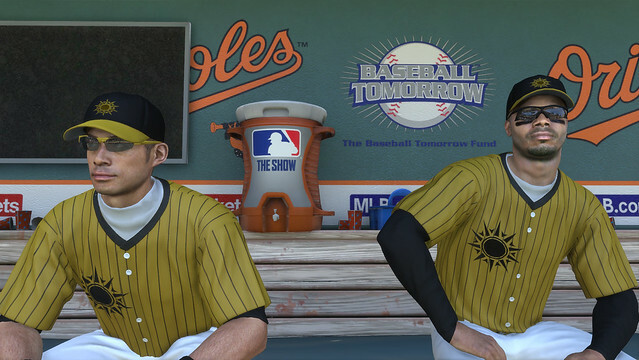 Items — including players — are rewarded to you just for playing games in MLB The Show. Items and players do not have contracts; if you find an item, it’s yours to keep and utilize as you see fit. Weekly Missions and Programs reward you with items when you complete specific challenges. The Community Marketplace allows you to play stockbroker, as you can buy and sell items in this completely dynamic, player-driven economy. Our pack offerings in game and in our various editions allow you to acquire items at your own pace. 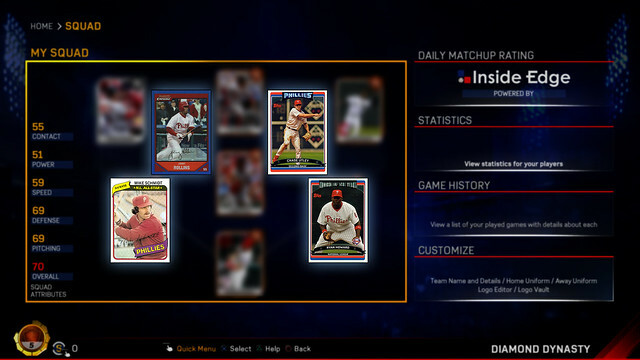 Our in-game currency, Stubs, is rewarded to you throughout your gameplay experience. Ranked Seasons: Compete against other players online in head-to-head (PlayStation Plus required to play online) action as you attempt to climb the ranked leaderboard in order to acquire unique rewards. We’ll be running new seasons every few weeks, so you’ll have a fresh new challenge and a new set of rewards to strive for. Events: Events enter Diamond Dynasty in MLB The Show 17 and challenge you to build a team based on themed Event rules. Speedsters, sluggers, and switch hitters will have their moments to shine in these rotating, time-limited Events. Be strategic with your lineup decisions, field your best team, and take on opponents to earn Event rewards based on your hot streaks and overall win totals. Conquest: Assert your team’s dominance across North America as you attempt to conquer each MLB team in this single-player, strategy-focused, experience. Battle Royale: Battle Royale is the most challenging and competitive game mode Diamond Dynasty has ever seen. In this player-versus-player experience, you’ll be challenged to draft a team and outlast opponents in a double-elimination tournament to acquire unique rewards. And Much More: Play casual, unranked, games against other players online, play with your friends in custom challenges, play against any of the 30 MLB teams, or play against another players’ Diamond Dynasty teams controlled by the CPU. Stay tuned for updates from MLB The Show, as we’ll have a steady stream of additional content dropping throughout the year. 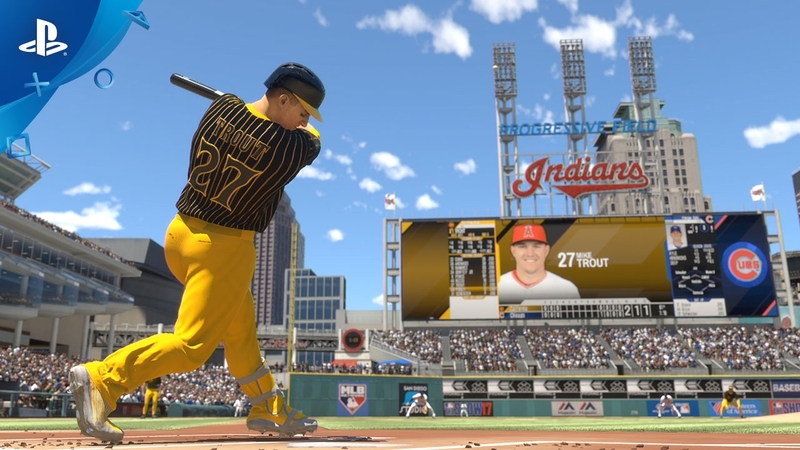 Diamond Dynasty will see the addition of new players (legends, flashbacks, and more), daily attribute updates for current-day MLB players, new Missions and Programs, updated rewards in many of our modes (Ranked Seasons, Battle Royale, Events, Conquest), and promotional packs and store items. Thanks for reading, and we’re really excited to see you out on the field with the team of your dreams. Stay tuned for more updates, and make sure to pre-order your copy of MLB The Show 17, launching on March 28! And don’t forget to follow us on Facebook and Twitter for the most up to date information on The Show 17. I love how MLB The Show supports 3D audio with Sony’s awesome Platinum Headset, but will The Show 17 support PS4 Pro on day one? Pro support factors in when i make purchases and i think The Show would look stunning at 1400-2160p with hdr. Wow, Diamond Dynasty looks every bit as good as MUT. I hope you’ve added a ton of legends from every era. This could become my new addiction. I honestly think San Diego doesn’t get the credit they deserve, every year The Show is great. yay, baseball, so exciting. bats, balls, I love it. Yes, please bring back the PSN Store updates! Without those weekly updates and sale listings there is little reason to keep checking here IMO. I am getting this title this year! What will the download size be and what about searching for an opponent, (will I be able to change server location). Thx!